Get Iona Portal on your Kindle NOW for just $.99!!! I’m celebrating Iona Portal’s successful first year with a month-long anniversary sale. Don’t miss your chance to get Iona Portal on your Kindle for just $.99! (Sale ends August 31) CLICK HERE to go to Amazon’s IONA PORTAL page! A big question for many beginning writers is, “How do you find time to write?” I think all of us have asked that from time to time. We have an idea of a great book… but weeks and months go by and the book doesn’t get written. There just never seems to be enough time! yourself to write a certain number of hours each day, or turn out a certain number of words each session. If that works for them, that’s great. I know that approach would not work for me. My problem is, I have never had time to write. I In my “day job” I’m a teacher, conference speaker and dean of a school. I also spend a lot of my time travelling. For most of my adult life, a typical work week has been 70 or 80 hours. Every week. There’s always been more to do than I have time to accomplish. I’m not complaining. I love what I do! I teach, I travel, and I speak. But it’s a very demanding career. Yet I’ve also had a strong urge to write. I always seem to have four or five books simmering on the back burner of my mind, just waiting for the time they can make their escape onto a printed page. My first non-fiction book was written on vacation. The book had been burning inside me for months. So while my wife and kids relaxed and visited with family and friends, I sat with laptop open, writing. For me, writing always has had a pregnancy aspect. I have a book on the inside and it’s growing and developing, looking for a time it can be birthed. And when that time finally comes, there’s no holding it back. Because of that, I find it hard to relate to statements from writers who have to discipline themselves to grind out a certain number of words a day. To me, writing is not a job or a chore. It’s a consuming passion. It’s not a task I must remember to do, like cutting the grass and cleaning the garage. The book growing within me becomes a living thing, demanding to be expressed on paper, threatening to explode if I don’t let it out. At the start of the project, I had a vague idea of what the book would be about, but not a clue as to any details. I started with the characters. I wrote a biography of each one, formed a mental picture of them, even scoured the internet to find photographs that matched my mental image of each one. These people became more than names on a page. I knew their strengths and weaknesses, their struggles and fears… even the sound of their voice. (Michael Fletcher sounds a lot like Sean Connery.) I knew them so well, I’d be walking through an airport and see someone walking the other way and think… “She looks just like Lys Johnston!” In short, these characters became real people to me. I CARED what happened to them. Stephen King once said, “I try to develop sympathy for my characters, then I turn the monsters loose!” That was my next step. Once I had the characters, I let the action start. Iona Portal begins with a gripping scene where our strong female lead, Lys Johsnton, finds herself driving a narrow mountain road in the middle of the night pursued by two strangers with blood-lust in their eyes. I wrote the first version of that chapter with no idea where the story was going. Lys Johnston was in a dire situation, but I cared about her, and willed her to survive. In the next scene, I added the next character. The characters began to interact. Then, as the story progressed, the direction of the book became clear. More characters were added, and “the plot thickened!” How would these people manage to survive and save their world from disaster? And so the story gripped me. It burned within me. I didn’t have to schedule times to crank out words. I’d often wake up at 3 in the morning with the next part of the story racing through my mind. I’d get up, pour myself a coffee, turn on my laptop, then lean back in my recliner … and write. I had no choice! Lys Johnston needed me! She had to find a way to overcome the armies of darkness and save the planet from destruction!!! So that’s my advice for time management for writers. Don’t allow your writing to become a mechanical chore. Don’t let it be a job or an obligation. It has to be a passion! If the story doesn’t grip you enough to draw you back to write, how will it ever draw your readers back to read? So, be excited about what you are doing. Be passionate. And the time to write will come. NOTE: This was written a few months back as a guest post for Dean Rich’s blog, The Write Time. Please check out Dean’s blog for more tips on time management! Iona Portal is now available in every format, including paper! Iona Portal is now “fully published.” By that I mean that it’s finally available for every kind of reading device, as well as in paperback. If you haven’t been able to find Iona Portal in your favorite format in the past, your wait is over. Check out the links below, and enjoy! 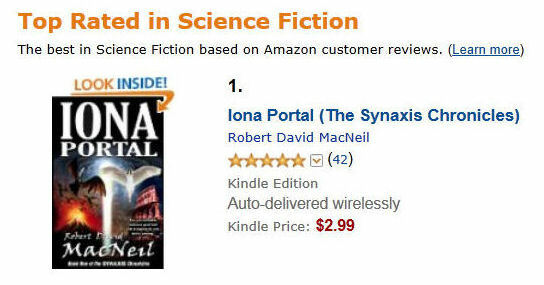 BREAKING NEWS: IONA PORTAL is now the top-rated SF book on Amazon!! I’m overwhelmed by the enthusiastic response of Iona Portal’s readers! (A man told me recently that Iona Portal is his wife’s favorite book… He said she’d read it at least ten times.) Reviews have been abundant and consistently positive! But it was still a surprise when I looked on Amazon and discovered that IONA PORTAL IS NOW AMAZON’S TOP-RATED SCIENCE FICTION BOOK! All I can say is THANK YOU to my readers! Today I turned 60! That means I remember when gas was 25 cents a gallon. I actually still have a watch and I still use my cell phone to make calls. My hip is now more accurate at predicting the weather than the Channel 8 weather man. Last summer I went to my high school reunion and realized there was no one there but old people. I have more hair in my ears now than on my head and sometimes I am not sure whether I have a clear conscience or I just don’t remember. I sat down at the breakfast table this morning and heard that old familiar snap, crackle, pop but I wasn’t having cereal. I went in the bathroom and flexed my muscles in front of the mirror and found that my biceps had gone to live with my triceps. Had a pleasant surprise, though, when I walked in my closet I found some clothes that had actually come back into style. Last week I walked into one of those quaint little antique shops and saw some old-fashioned kitchen implements and realized that I used to use most of them. Later I got on an elevator and heard songs that my parents had forbid me to listen to …but they were somehow different. Today the fact that I have been losing brain cells since the day I was born has suddenly become a big concern to me as well as the thought that I would now probably be one of the first ones thrown out of the lifeboat. But at least there’s not much left for me to have to learn the hard way. All in all I had a great day and a great party with my family even though my kids had to disable the fire alarms in order to light the candles on my birthday cake, and my happy thought for this special day was that I had three more years before I had to get another colonoscopy. Nook version of Iona Portal coming soon! I can’t remember the last time I did a blog post. It’s been an unusually busy season… I’ve been struggling to get over jet lag from the Thailand trip and getting ready to speak at a major conference this weekend. On top of that I’m trying to get the Nook version of Iona Portal ready for publication. I’m doing the Nook version through Smashwords, which will also make versions available for all the other e-book platforms. It’s quite an experience. The Smashwords instructions are very detailed, and more than a little intimidating! One of the first steps to publish on Smashwords is to strip away ALL formatting!!! How’s that for frightening? Centering. Bold text for chapter titles. Even italics! It’s all gone! Now, in addition to everything else, I need to go back through the whole book, line-by-line, and add these things back into the text. My goal is to have the Nook version published by the end of next week.